Charming and bright open-plan Penthouse loft with beautiful wooden beam ceilings and unique design features. And best of all, a sitting area to relax and soak up a magnificent panorama of the Cathedral, the Alhambra and Sierra Nevada ..... possibly the best views in all of Granada. 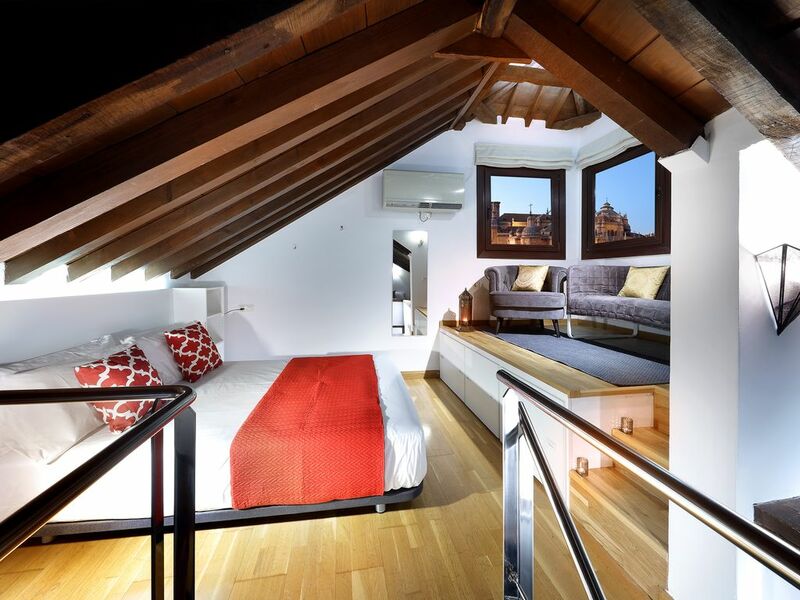 Unbeatable location at km 0, just steps away from the Cathedral, the Town Hall and Bib Rambla square. From here you can reach all the main sights by foot. Fully-equipped for maximum comfort. Facilities include air conditioning / heating, Wifi, towels, bed linen and duvets. Spread over two floors: on the lower floor, the kitchen, living-dining room, and the bathroom; On the top floor, two bedrooms linked by a glass walkway (one with a queensize bed and the other with two singles). And being on the top floor means that silence and peace prevail. Reduced rates for guests at the closest public car park, San Agustin. I´ve been living in Granada for over 10 years and can´t wait to share my local knowledge and passion for this city with you. Alhumbra is located on a commercial pedestrian street where at night you can enjoy great tranquility. In the heart of Granada and close to the most emblematic monuments, we are right next to the XIV century "Corral del Carbón", a minute walk from the Cathedral and Royal Chapel and a 20 minute walk to the Alhambra. The city's train station is about 15 minutes away by foot and the bus stop to the airport a minute's walk away. Enjoy the very best views of Granada from our exclusive mezzanine lounge. This is not your typical "cookie cutter" apartment. With its floating staircase, glass walkway and breathtaking views our Loft is 100% orginal and unique. You will find nothing else like it in Granada! Beautiful bathroom all in Italian stone and with a large mirror. Air con in every room. Cooling and heating functions. Washing liquid and fabric softener provided. 42" plasma TV with Spanish channels and radio. Google Chromecast, so you can access content through your mobile. Small terrace with table and chairs. Original apartment, perfect location and spectacular views! This Penthouse apartment has a unique style and tons of character, we really loved it here. It´s well-equipped and beds are comfy. The views are particularly unbelievable, you can see the whole of Granada including the Alhambra, Sierra Nevada, and the Cathedral (which feels close enough to touch). We found the location ideal as you´re right in the very center yet it´s surprisingly quiet and peaceful inside, we slept really well. It´s also just a two minute walk from transport connections (bus, train, airport) on Gran Via and close to all the main attractions. In a few minutes we could walk to the old Arab quarter, but without having to deal with all the hills, steps and narrow cobbled streets that actually staying in the Albaicin might entail. Finally, Elizabeth was very warm and greeted us on arrival with maps and lots of great tips/restaurant recommendations. We would highly recommend this place... if it´s available! My dear friend and I had a wonderful trip to Granada . The apartment was great two bedrooms one bath overlooking the city . Elizabeth was more than attentive she got back to me on every question in a very short time . The apartment is safe and it is in the heart of the city if that is what you are looking for . We absolutely love Spain and it was very close to all the historical sites . Thank you Elizabeth for your hospitality and attentiveness . My only complaint was there was a party going on next-door but it did settle down and the owners had no control over that Incident. My husband and I had a wonderful experience staying at the Alhumbra Penthouse. We arrived in Granada on a red-eye from the U.S. and Elizabeth very kindly let us drop off our luggage before the check-in time. She met us at the apartment and gave us a great orientation to Granada, including recommendations for hiking trails. The apartment itself is so unique: it is charming, spunky, and fun - plus it has fantastic views. It had everything we needed, and then some (thank you for providing toiletries!). My parents joined us for our last night in Granada, and the apartment was roomy enough for four. We would definitely stay at the Albumbra Penthouse again! The Penthouse was exactly as described. We were met by Jamie and she showed us around the Apt. and gave us an overview of the area. Everything was within walking distance and what wasn't was a short taxi ride away. The area is full of good restaurants and lots of stores if shopping is your thing. It was fun exploring the side streets and getting lost in the warren of streets only to find hidden gems worth seeing. We spent a day walking the Alhambra - every step was amazing.